Many people might look at me and assume that I’m just an inventor but there are other things I’m very passionate about. I’ve been a pilot for over 60 years now, and I have a number of private planes. One of my favourite planes is M-DSKY, a Daher TBM 910 which is very fast turboprop aircraft. One of the most exciting flights I’ve done was to fly from Stornoway in Scotland towards the Faroe Islands (part of the Kingdom of Norway) on the day of the Solar Eclipse (March 20 2015). When I told the people at Daher TBM my plans, they ran a story on their website that you can see here. Sky News’ Technology Correspondent Tom Cheshire accompanied me on the exciting flight and you can see his superb report below. 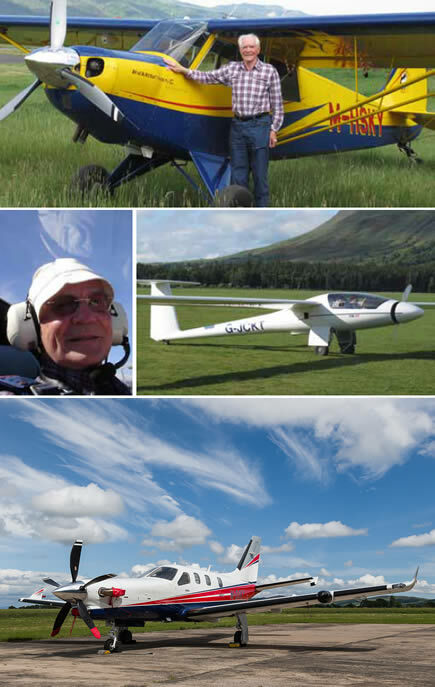 My father taught me to fly when I was a teenager and since then I’ve amassed over 5,000 hours of flying just for fun. I suppose the biggest honour to have as a passenger was Prince William. He wanted to come to the Isle of Man to see part of the TT races, and the Governor at the time Air Marshal Ian Macfadyen asked me if I would go and fetch a visitor. Of course I agreed, only late in the proceedings finding it was Prince William and his friends who wanted an incognito visit to the Isle of Man. I went to Lyneham, and collected him and his party and we flew them back to the Isle of Man incognito, and he had a holiday on the island with his friends, went round the TT course in one of the cars. He was here about three days before anyone recognised him, so I think he will have a soft spot for the Isle of Man and then I flew him back to Lyneham and the party. I once had a co-pilot who was the most famous pilot in the world, Neil Armstrong, and like me he is interested in navigation. He had heard about my Chronophage clock and he wanted to come to Cambridge to see it. He flew specifically to England to meet up with me in Cambridge, and I showed him the clock, and then we had dinner at the High Table in Corpus Christi, my old college and then we went to Marshalls Airfield, and he was my Co-Pilot flying to the Isle of Man. He spent a couple of days on the island. That was a great thrill to have such a world famous aviator as my co-pilot.